BBC NEWS | Science & Environment | How do you catch a python? 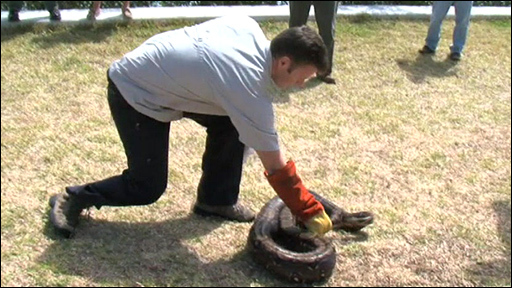 How do you catch a python? At one time they were just pets, easily bought across the counter for as little as £10. Now experts say that pythons, which can grow up to 23 feet, are a major threat to the native species of the Florida Everglades. It is thought that they were released by irresponsible owners and are now thriving throughout southern Florida. Now some have grown so large that they are eating the alligators that live in the Everglades. The authorities in southern Florida are fighting back by launching 'Python Patrols'. Miami correspondent Andy Gallacher went along to learn how to catch a python - and to find out just how big a threat these reptiles can be.